starting kits for bubble tea ! Looking for a bubble tea kit? With a starterskit from Inspire Food Company you can prepare delicious bubble tea drinks. As we offer complete kits, no extra’s are required. A bubble tea kit can come in handy for at home, at the office or during a party! The Inspire Food Company was founded on the principal of supplying high quality bubble tea ingredients and related supplies for honest prices. 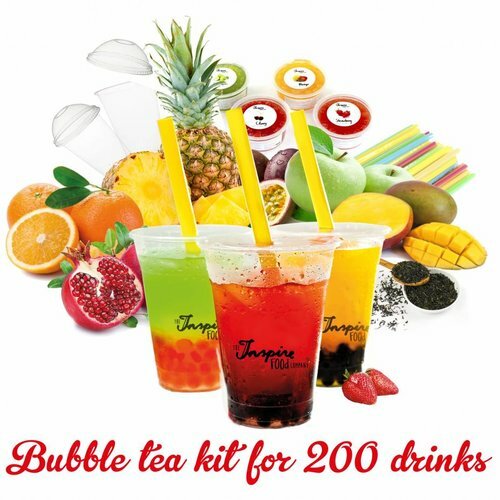 You can quickly and easily order a bubble tea starterkit on our webshop. You place the products in the shopping cart after which you can register an account or register as a guest to place your order. Afterwards you can fill out your personal details and choose from several payment options such as iDeal, PayPal, Visa or Banktransfer. We offer quick delivery throughout Europe. Have any additional questions or would you like to contact us before placing an order? You can always email us at info@inspirefoodcompany.com. Or call us at +31 (0)302271810.